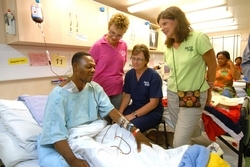 Blood donors Marilyn Hansen (left), Joan Kotze (middle) and Kay Olive (right) visit with surgical patient Ambroise in a recovery ward onboard the Africa Mercy while docked in Benin, West Africa. Ambroise received blood from the three women and an additional nine other volunteer crew members during an operation to remove a large tumor from his arm. Millions of people around the world owe their lives to individuals they will never meet -- people who donate their blood to help others. But crew members on a Mercy Ship live and work just minutes away from the patients who receive their "gift of life" every day in West Africa. First-time blood donor Marilyn Hansen from Los Angeles, California, volunteers onboard the Mercy Ship currently docked in Benin. The former teacher's blood donation along with that of 11 other blood donors onboard ship recently helped save the life of 34-year-old Ambroise, a patient who received a surgery for a large, benign, but growing tumor. In honor of World Blood Donor Day (June 14), Mercy Ships recognizes volunteers such as Hansen for their willingness to go the extra mile to bring hope and healing to world's forgotten poor. Hansen says that she had never donated blood at home. People gave blood for money, it went into a large blood bank, and "there were plenty of people to give blood. I just never felt like they really needed me to give." But she added that meeting the person whose life was changed by her donation has made all the difference. "I got the call from the hospital lab, and they asked, 'Come right now.' They said a patient was currently in surgery and was losing a lot of blood. Later I met Ambroise down in the ward. It was amazing to see him doing okay and to find out more about his family and his life here in Benin. Anywhere else, I'd never get the chance to do that," commented Hansen. Ambroise, who makes his living as a zemidjan driver (motorbike taxi), received more than 12 pints of blood during his surgery. Since childhood, he lived with a tumor on his shoulder. The tumor grew and spread along his arm. It was painful and debilitating. He was not able to carry anything and had to wear a long-sleeved shirt every day because he was ashamed of the large growth. When Ambroise was a baby, a doctor had told his parents they could perform surgery to remove the tumor. But his parents were afraid. Later, when he was older, they could not afford it. Now, after a free surgery onboard the Mercy Ship, Ambroise can drive his zemidjan all day without pain. He can lift and carry things. He is feeling strong and is thankful. The blood bank onboard the Africa Mercy is not stored in a refrigerator in neatly labeled packages for days or weeks. Instead, the 400-person volunteer crew sign up to give blood on demand to help patients being treated in one of the six state-of-the-art surgery suites onboard the floating hospital that sails to a different West African port every year. "The Africa Mercy is unique as a 'walking' blood bank," says Sarah Louden, Australian medical technologist. "We usually have about 30 potential donors for each blood type." The laboratory onboard compares the patient blood samples, which are taken and tested upon admission, with the potential crew donors. Crew members are contacted as needed. Louden says that currently 118 crew members onboard the Mercy Ship have signed up to donate blood on call. Crew can be asked at any time day or night to give a pint. Often, the donation, still warm, is walked straight over to the patient. Since the ship began surgeries in the port of Cotonou this past February, 60 units of blood have been donated to 21 patients, according to a ship's spokesperson. With the help of the Mercy Ships floating blood bank, the medical crew onboard the Africa Mercy expects to impact more than 53,000 people through the hospital ship's services during its 10-month stay in the West African port. Interviews with crew are available. Hi-res photos and general Mercy Ships broadcast footage clips are available for download at http://www.mercyshipsnews.org or upon request. 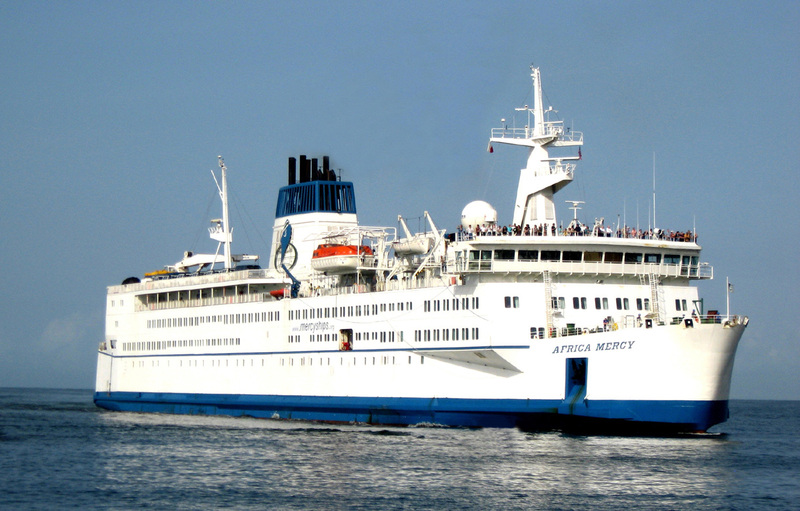 The Africa Mercy is the world's largest non-governmental hospital ship. The crew of the vessel expect to impact 53,000 lives during their ten-month stay in Benin via free surgeries in the six state-of-the-art operating rooms onboard, as well as other onshore programs.